Carrying epinephrine on day and overnight trips has become common practice for outdoor programs with staff trained in Wilderness First Aid (WFA) or Wilderness First Responder (WFR), or who have participated in an epinephrine training. Due to the seriousness of anaphylaxis, schools and other front country organizations are also likely to have staff trained in epinephrine administration. Additionally, it is common for individuals with known allergies to carry a personal prescription of epinephrine. Over the past several years a variety of manufacturers have produced epinephrine auto-injectors. It is important for individuals trained and responsible for the use epinephrine to be familiar with the variety of epinephrine auto-injectors. In addition, prescriptions other than epinephrine are also beginning to be placed in similar auto-injecting devices. Prior to use of any medication; confirm the type of medication, who it is prescribed to, and that it is within the expiration date. Epinephrine auto-injectors are available in two dosages; 0.15 mg dose for individuals 33-66 pounds and 0.30mg for individuals above 66 pounds. See manufacturer websites, your doctor, or your program’s medical director for specific and detailed instructions for each of the auto-injectors listed below. 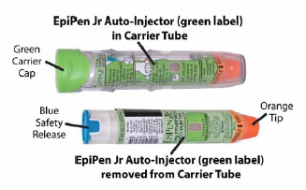 The EpiPen adult dose is in a device with a yellow label and the EpiPen Jr (child) has a green label. EpiPen works by removing the carrying case, removing the blue “safety” cap, pressing the application end of the device into the lateral (outer) aspect of the mid-thigh until the device clicks, hold in place for ten seconds, and dispose of device in an appropriate location. 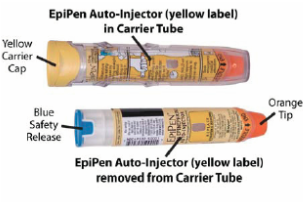 Both the EpiPen and EpiPen Jr. are designed to administer only one dose of epinephrine. ​Adrenaclick is administered similarly to the EpiPen. The additional step of removing the cap on the injection end of the device is needed to prepare for administration. The child dose has a purple colored carrying case and the adult dose has a black carrying case. Both child and adult devices administer one dose of epinephrine. ​The TwinJect injector holds two usable doses of epinephrine. The first dose is administered similarly to the Adrenaclick. The second dose is accessed by removing the red cap on the injection side of the auto-injector. After removal of the cap, a syringe (same needle as first dose) is accessible for the administration of the second dose. Due to the multiple components to the TwinJect, it is highly advisable for individuals who have exposure to the device receive training with TwinJect training tools. ​Auvi-Q (Allerject in Canada) is a smaller pocket sized device. The device provides audio prompts to assist in administration of medication. The prompts work in the same way an AED provides direction for usage. The red packaged Auvi-Q is the adult dose and the blue packaging indicates the child dose. The Auvi-Q is designed to administer a single dose of epinephrine. ​Due to the ease of use, other medication (i.e., Alsuma, acute migraine medication) has been placed in auto-injectors. The device looks similar to epinephrine injectors and care needs to be taken to ensure medications are not confused at the time of administration. It has been suggested by members of the medical community that programs label non-epinephrine injectors as “NOT EPI” to provide fast identification during emergencies. This practice may reduce the potential of confusion or misadministration of medication by program staff. Gaudio F, Lemery J, Johnson D. Wilderness Medical Society roundtable report: recommendations on the use of epinephrine in outdoor education and wilderness settings. Wilderness & Environmental Medicine. 2010; 21:185-187. Hawkins S, Weil C, Fitzpatrick D. Epinephrine Autoinjector Warning. Wilderness & Environmental Medicine.2012; 23:371-372.